Calling all Young Bond fans! Look out for a brand new and limited edition of The Young Bond Rough Guide to London, free with the Guardian on Saturday 7th April. What would Young Bond do in London over the Easter Weekend? 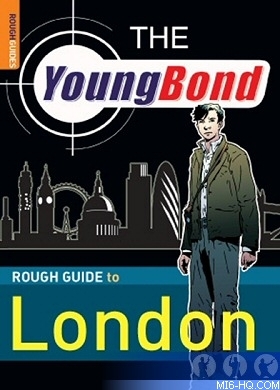 Take a tour of London with the one and only James Bond in this special Young Bond Rough Guide to London follow the trail of the school boy who became the world’s greatest secret agent. The compelling guide to Double or Die, Charlie Higson’s third Young Bond novel, reveals the fictional character’s roots and explores all the places that act as a backdrop to his exploits: From the East End Docks where James escapes from Babushka the Russian spymaster to spooky Highgate Cemetery, which sets the scene for the kidnapping of James’ school master; Lincoln Inn Fields with its pickled organs in jars and on to the West End, the most glamorous part of 1930s London. Take a virtual day trip to Bletchley Park, Cambridge and Eton, all of which played crucial parts in the latest Young Bond book. The guide also introduces the best of London’s sights – from museums to zoos and football grounds – that James would visit if he wasn’t too busy saving the world. Available only in the Guardian, distributed in London and the South East on Saturday 7th April, this guide is an essential for all Young Bond and Bond fans.